Sweden is perhaps not the first country that springs to most people's minds when planning a sea kayaking expedition, but with 2000 miles of coastline and with archipelagos along both the western and eastern coastlines, including 24,000 islands (or 50,000 depending on how you count) easily reachable from the capital Stockholm, Sweden makes a wonderful destination for a sea kayaking holiday. 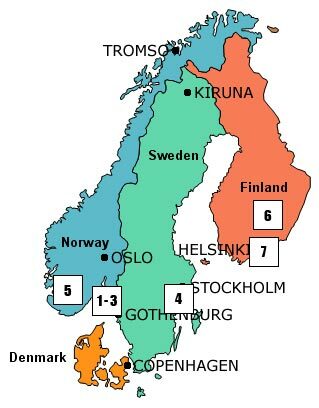 Finland offers similiar possibilities, with the country's archipelagos containing around 40,000 islands in total! The east and west coast archipelago areas in which our kayak tours in Sweden take place have their own special attraction. Sweden's west coast archipelago is typically more rocky and less forested, with lovely rock colours and formations. The Stockholm Archipelago has heavily forested islands in the inner archipelago becoming more open and rocky as you move outwards, while the St. Anna region to the south of Stockholm is renowned for its picturesque islands and is one of Sweden's premier sea kayaking regions. In all cases you are travelling in a coastal landscape, so will pass coastal villages, some summer houses, etc. The nature of the areas and of sea kayaking means that you have a fair amount of flexibility in terms of the route taken and distance covered. For tours featuring wild camping, you will choose your own camping spots each night, very possibly on your own private island! Finland also offers endless possibilities for both coastal and inland paddle tours through its extensive archipelago and lake network. We currently offer sea kayaking in the Sipoo archipelago area to the of Helsinki, and for our tours in the Linnansaari National Park it is possible to choose kayaks as an alternative to canoes to explore the lovely Saimaa lake region. 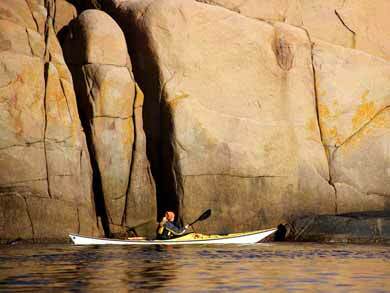 Nature Travels offers a range of both guided and self-guided sea kayaking holidays. A guided tour is ideal for solo travellers, couples or small groups of friends, for those with limited experience or for more competent paddlers who appreciate the extra dimension an experienced and knowledgeable local guide can bring to the trip. Novices will find that, as a well as offering a more secure environment for your paddle adventure, a guided tour is also a wonderful introduction to sea kayaking in itself. While self-guided tours are not intended as training courses, you will be given instruction in paddle technique and safety before setting off and have the chance to pick up plenty of tips and guidance along the way. You should find that both your technique and confidence quickly improves. A number of our tours also feature optional instruction before the tour begins, which is an excellent way to refresh or learn new skills before setting off. Both single and double kayaks are available on most tours - please specify in advance which you would prefer. Double kayaks (K2s) are the most stable option and are ideal for beginners or those with less confidence, or for those who would like a partner to share the paddling with! We offer options for guided sea kayaking in the beautiful archipelagos of Sweden's east and west coasts and just outside Helsinki in Finland. 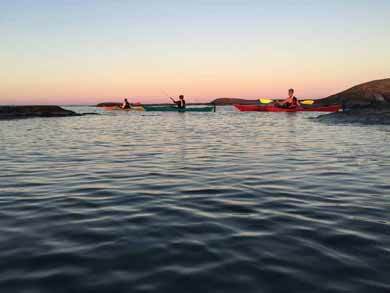 On Sweden's west coast, Sea Kayaking Camp in Bohuslän begins with a core itinerary with accommodation in hostel or hotel and featuring instruction day plus two guided day tours. There are then a number of extensions possible, including additional instruction, a guided multi-day tour with wild camping and a multi-activity option including mountain biking and climbing. For a stand-alone option for guided kayaking in the Bohsulän area, West Coast Kayaking Adventures features a choice of four3-day/2-night itineraries exploring the Koster National Park, Fjällbacka, Orust or Havstenssund archipelago areas. These tours also offer a great opportunity to develop your paddling skills with information instruction and guidance along the way. In the Stockholm Archipelago on Sweden's east coast, Overnight Sea Kayaking in the Stockholm Archipelago offers a guided alternative to our self-guided tours in the area, with two full days' kayaking and a wild camping overnight, perfect for a short getaway or in combination with other activities in the Stockholm area. In Finland, Weekend Sea Kayaking in the Helsinki Archipelago offers a guided and very accessible alternative to the self-guided tour in that area. Scheduled dates are 2 days/1 night offered Saturday-Sunday, making it ideal for a weekend break in combination with some time in beautiful Helsinki, or for groups of min. 4 persons, private guided tours of longer durations are also possible on request. Self-guided sea kayaking is suitable for those with greater confidence on the water or who enjoy the flexibility to explore at their own pace and create their own adventure each day. For some tours, introductory courses can be added to develop your skills before you begin. On Sweden's west coast, Self-guided Sea Kayaking in Bohuslän is a flexible tour with start days by arrangement between May and September. You can choose durations of 3-6 days, basing your tour on either a 3-day route or 6-day route (whichever option you choose, there is plenty of opportunity to extend the distance and areas visited depending on wind and weather conditions and your own experience/energy levels). Camping and kitchen equipment is available to hire as an optional extra and the experience can be conveniently combined with a day or two in Gothenburg. Previous kayaking experience is not essential, but we recommend choosing the optional 1-day introductory course if you have not paddled before or with to improve your skills and confidence before beginning your trip. 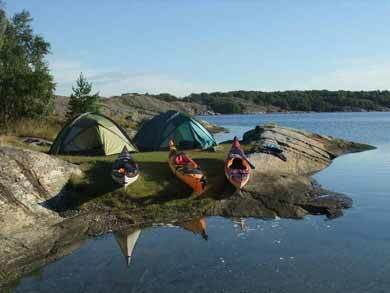 Sweden's east coast archipelago also offers world-class paddling. Closest to Stockholm, the Stockholm Archipelago Self-guided Kayak Explorer is a very flexible option easily accessible from the city, exploring a Middle Archipelago with flexible durations of 3 or more days. As with all self-guided kayak tours, there is the option to make the tour as challenging or accessible as you wish, from an easy-going and relaxing few days to a more challenging adventure! A little to the south of Stockholm, our Discover Sea Kayaking in St Anna and Gryt is a 3-day tour based on cabin, guest house or tree tent accommodation, which can be easily extended with additional nights in the same accommodation and/or, for the cabin and guest house options, extra nights wild camping in tent. As the experience features day kayak tours from a fixed base, this tour offers a great deal of flexibility to vary the distance covered and level of challenge and is therefore suitable for novices and families (min. age 7) as well as for more experienced kayakers. Whether you choose a self-guided or guided kayak tour, on the east or west coast, Sweden offers world-class paddle possibilities, and the freedom to camp wild is a special privilege that enhances the adventure! Starting just 30 minutes from Helsinki, Self-guided Sea Kayaking in the Helsinki Archipelago offers a very flexible option to explore hundreds of islands for any duration 2 or more days. The optional day instruction course is recommended for novices and gives you the skills and confidence to make the most of your paddle adventure among the sheltered islands. More experienced paddlers can choose longer durations and explore further afield. For an option for kayaking in an inland setting, Canoe or Kayak in Linnansaari National Park, located in the east of Finland in part of the vast Saimaa lake system, offers wonderful possibilities. Beginning with accommodation in eco-studio, the tour has flexible duration with 4 or more days' paddling exploring the beautiful Linnansaari National Park. Both double and single kayaks are available as an alternative option to using 2-person Canadian canoes.